Is Smart-Winners a Scam or Legit? Read 10 Reviews! Deposit: Visa, MasterCard, Maestro, Skrill, Ukash, etc. Smart-Winners Exposed — Is It Smart to Play There? Are Syndicates Smart at Smart-winners.com? When we first started looking at smart-winners.com, the team figured we might have found something different. This is an online lottery provider for individual tickets and syndicates. The site is pretty straightforward and easy to move around with a few twists. In their ‘About Us’ they have a section on meet their team. The other something slightly different is their Smart Play which is supposed to help players choose their numbers. Let’s go take a look. The games at Smart Winners range from the big boys, including US Powerball and EuroMillions to US Colorado Lotto and New Zealand Lotto. There is a minimum purchase of two lines across all games and they do offer consecutive play. It’s all pretty standard, though some of the games they offer are different. I didn’t know about Russia’s 6/45 and 7/49. The only issue is that some of these games can’t be played by anyone outside of that country. Smart Winners offer three syndicates. “Pot of Gold” includes EuroMillions and SuperEnaLotto with 100 lines in a syndicate and is $19 per month to buy in. “Treasure Chest” has 440 lines per month in six lotteries for $57 per month. “Strike It Rich” has 520 lottery lines in seven lotteries at a buy in of $81 per month. Click on their “Like” and “Share” on Facebook and players get a 50% discount. “Tweet” to your friends and get a 35% discount. Both can only be used one time. I’m not sure how smart Smart Winners’ Smart Play is but what it boils down to is a quick pick system called Smart Picker using some sort of secret statistical model (their words). Then there are their statistics on best combinations. They suggest that the best combos are two even and four odd, or two odd and four even. They also break up the ticket itself to how many numbers should be chosen from the top half or bottom half of the ticket. This is a new one for me and if anyone has used it (and won), please let the team know! Looks like getting in touch with Smart Winners is not a problem. You can open a support ticket (and check its status); open a complaint (and contact their complaint department); call them by fax or telephone number. Also, Smart Winners website has a live chat window. We’re still not sure whether this is a good or bad thing, but in Smart Winners has a page to ‘meet their exclusive team’ of people around the world who physically buy your tickets. The point of this, we are guessing, is to build confidence in the fact your ticket will actually be purchased. 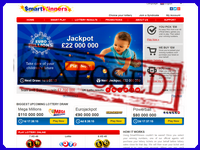 Smart Winners lottery service was founded in 2010. There is nothing that indicates this it is not legit. This lotto agent has its face and some unique features that distinguish it from the bunch of others. We are not giving Smart-winners.com thumbs up or thumbs down. This service looks promising enough, that’s why we ask you to evaluate it by leaving your feedback. Also the conversation was very very disinterest, the really don’t worry about reputation and client. Finally my duty is to let you know guys that you NEVER buy anything with them, maybe right now it’s OK and you don’t have problem with them but I’m assured that in the future something very bad and unethical will occur. It is a scam, in Israel once signed up you cant cancel subscription, they lie on the phone that subscription is monthly and one can cancel it at any time with no fees. I have the phone call recorded… Filing a law suit right now. They did everything they could not to provide us with any info, even when called a couple of times a week to cancel our participation at first they requested signed form but didn’t send the form to fill. It took a week or two then once they sent the form they didn’t call back, as they promised, to cancel the subscription. When I called them I was surprised to realise that we own them a fee of 80% of the yearly cost for the membership. Which is idiotic since we “play” the looter for 2 months already..
Their contract is against the local law and I hope they will pay for it. Also for some reason one of the contact phone numbers on a local Israeli site is a Russian number, wtf! There is no system, no “smart people” behind it, it is plane scam, no reason to pay money to another middle man. They hide their true identity. You only have their trade name. If something goes wrong – no legal entity or people to serve documents. Nothing you can do. No customer service. They never answer. All the comments here are phony. I used Smart Winners last month I won $400 I was paid immediately, they verified my ID and I was paid, I will be definitely using this platform. Very interesting system, already won few $, not as much as I would like to, one day I will win the Powerball jackpot till then I will continue playing… Thank you! I usually play with Smartwinners. Nice and easy interface, good customer support with live chat. They payout on time. I recommend it to play. I saw this comment about smartwinners not paying out so let me just tell you that my first ticket I bought on smartwinners won around 5000 euro, they paid out after few simple verification steps. Since then I have played regulatory on that site. The site has a fast support and they bring a good luck. I regularly play with Smartwinners and I am quite pleased with the service and customer support. I recommend it to all my friends! Smart winners have done the same to me. I have called them 4 times and was told each time someone would call me back within 24 hours, but still have not received a call nearly a week and a half later. I have winnings that I cannot collect but was quick enough to take money from my bank. And have all my details. I’m quite worried about this and will be taking it further. We have not received any winnings withdraw request from you. We process all requests within 24 hours, you are welcome to log into your account and withdraw your winnings at any time. You can withdraw to your card or directly into your bank account. Feel free to contact us by live chat at any time. DO NOT PLAY AT SMART WINNERS. They straight up ripped me off. They owe me $145 and completely shut down communication with me. I have tried several times to get the money but all attempts have failed. I am from SmartWinners, share your username on SmartWinners for me to investigate this issue.